Also, has anyone ever actually been involved in a food fight. I haven't but as long as I wasn't wearing anything too essential (and as long as pineapples aren't involved), I assume it would be a blast. These little devils remind me more of annoying room mates than an actual threat to anything. I love how one of them has it's tail trailing up one of the guy's nose. 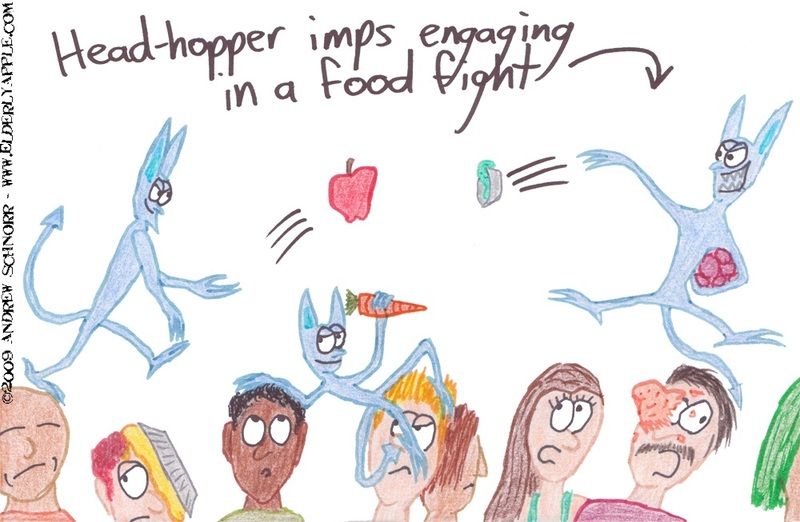 On second thought, those imps are pretty scrawny - If they stopped flinging food at each other and actually ate it, I'm sure they would bulk up in no time. well, in classical literature, "imps" did refer to things that were more mischievous than actually evil, so i can see the annoying roommate comparison. and for the record, that relaxed looking one with the carrot worries me the most.